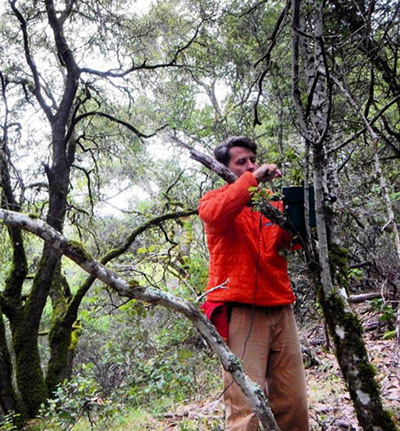 Researcher Matthew McKown deployed an acoustic sensor to record calls of marbled murrelets. Marbled murrelets are so secretive that biologists didn't even know where they nested until the 1970s, and monitoring the populations of these endangered seabirds remains a challenge. A new study, however, suggests that autonomous acoustic sensors used to detect and record murrelet calls could offer a viable alternative to surveys conducted by field biologists. In comparison to the traditional surveys used to find the shy birds, the new technology could enable scientists to conduct broader, more cost-effective searches, according to UC Santa Cruz graduate student Abraham Borker, first author of a paper on the new findings published in Wildlife Society Bulletin. Marbled murrelets are the odd ducks of seabirds. For most of the year, they sport typical marine bird plumage, dark on top and light on bottom to conceal them from predators above and below. But when breeding season nears, they turn a mottled ashy brown, which blends well with the coastal old-growth redwood forests where they nest. Murrelets sometimes fly up to 50 miles inland to nest, laying a single egg on a bed of moss high in a large tree. No one formally described a marbled murrelet nest until 1974, when an unsuspecting arborist stumbled across a chick at the top of an old-growth Douglas fir. Their population has since declined along with the old-growth forests they depend on. Today, much of their nesting habitat has been logged, and marbled murrelet populations in Oregon, Washington, and California are considered endangered. Scientists are trying to assist the murrelet's recovery by relieving pressure from nest predators and protecting old-growth forests. But to know if those efforts are working, said Borker, researchers need to assess how murrelet populations are responding. "We need measurements to judge whether our conservation efforts are successful," said coauthor Donald Croll, professor of ecology and evolutionary biology at UCSC. "But that can take a long time, it's hard to get enough samples, and it can be difficult to do." To streamline the surveys, Borker and colleagues turned to technology. They tested autonomous acoustic sensors--recording devices that have been used to record other animal sounds such as whale songs and bat squeaks--to see if the devices could improve surveys for marbled murrelets. Over the course of the murrelet breeding season, the team conducted two simultaneous but separate surveys inside known murrelet nesting territory: one conducted by trained observers and another based on analysis of recordings collected by autonomous sensors. Back in the lab, automated detectors analyzing the field recordings identified just over 19,000 sounds as potential murrelet calls. After reviewing the recordings, researchers confirmed 7,218 actual calls, as the sensors sometimes mistook American robins and Swainson's thrushes for murrelets. Over the entire breeding season, the sensors detected more murrelets than the human observers for less money than traditional surveys. Though human observers detected more murrelets than the sensors did on any given morning, the sensors simply spent more time in the field than surveyors did, and they cost nearly $200 less than traditional surveys per site, according to Croll. "It's a lot less expensive to put a recorder out in the woods and have it turn itself on and off over many days than to have a person go out there," he said. "We can do this faster and more efficiently and cheaply by using these passive acoustic tools." Croll and coauthors Bernie Tershy, assistant adjunct professor of ecology and evolutionary biology, and Matthew McKown, a former postdoctoral researcher in their lab, founded a company, Conservation Metrics, partway through the study. McKown is now the CEO of Conservation Metrics, which specializes in acoustic wildlife monitoring. According to Borker, the sensors could lead to more expansive surveys because of the reduced cost and added field time. Eventually, they may provide a better estimation of how murrelets respond to conservation efforts. "This marriage of technology and wildlife monitoring is really exciting because we can start collecting data at much larger scales," said Borker. "When you can measure the outcomes for wildlife populations on the same scale you're doing conservation action, you start to get a much fuller picture of how good a job we're doing in protecting species or managing resources." Coauthor Portia Halbert, an environmental scientist at California State Parks, has worked on efforts to protect murrelets from predators. In 2014, Halbert and scientists at Humboldt State University planted decoy murrelet eggs filled with nauseating substances to deter Stellar's jays from raiding murrelet nests. More thorough surveys could help researchers better evaluate the effectiveness of such conservation efforts. The sensors offer another perk: permanent audio records of the murrelets' habitat. Whereas traditional surveys leave no physical record of the calls, the audio tracks could inform future research on the birds and their ecosystem, Borker said. "You can think about the sounds of an ecosystem as a bit of a heartbeat of what's going on in that system," he said. "There's increasing evidence that we can learn a lot from these soundscapes, both about individual birds that might be calling in them, but also looking at the levels of complexity and diversity in those soundscapes as a measure of ecosystem health." Borker, Croll, and Tershy are all members of the Coastal Conservation Action Lab at UC Santa Cruz. The lab's mission is to develop cost-effective solutions to conservation issues, with a focus on seabirds and island ecosystems. This research was funded by the Packard Foundation Marine Birds Program.